American electronics brand Vizio seems to be setting its sights a little bit higher, if its latest TV lineup is anything to go by. The company, best known for its budget models, announced at the Consumer Electronics Show in Las Vegas a major refresh of its higher end P-Series and M-Series TVs, a newly-rebranded V-Series (replacing its E-Series) and no mention at all of anything in its lower-end D-Series. The P-Series Quantum X 4K HDR TV is Vizio’s new flagship model, featuring a crazy high 2,900 nits of peak brightness thanks to its Ultrabright 2900 technology. 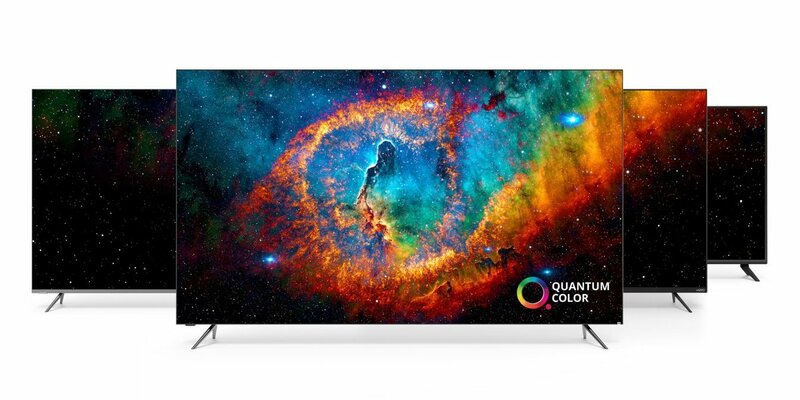 The TV, which will be offered in 65-inch and 75-inch varieties, also boasts Quantum Colour (essentially Quantum Dot) technology, which means the display incorporates thousands of tiny particles that glow when lit up to provide better colour vibrancy and accuracy. Other specs on the P-Series Quantum X 4K HDR TV include 480 zones of full-array local dimming, which means deeper blacks, better contrast and less halo effect. The TV supports both Dolby Vision and HDR 10 high dynamic range, and is housed in sleek looking bezel-less case with an aluminum design. The second TV in Vizio’s lineup is the P-Series Quantum 4K HDR TV, which is also available in 65-inch and 75-inch sizes. The main difference with this lower-priced model is the brightness, which peaks at around 1,000 nits, and the 240 local-dimming zones, which is half that of the P-Series Quantum X.
Vizio has also updated its mid-range M-Series, which now boasts 600 nits of brightness and up to 90 zones of local dimming. Other features in the M-Series, which is available in 65-inches and 43-inches, include Quantum Colour, Dolby Vision HDR and an aluminum frame. Last but not least is Vizio’s new V-Series, which it’s calling the “E-Series reimagined”. The E-Series used to sit between the M-Series and the company’s budget D-Series, so the V-Series can be thought of as a kind of mid-to-low end range. But if that’s the case it must be at the high-end of the mid-to-low end range, with models ranging in size from 40-inches all the way up to 75-inches. Alas, the V-Series lacks the Quantum Colour technology of its more expensive cousins, though it does support Dolby Vision HDR and boasts a fairly decent 400 nits of peak brightness. Vizio said its entire 2019 TV lineup comes equipped with its SmartCast 3.0 operating system, which provides easy access to apps such as Netflix, Prime Video, Hulu. In addition, Vizio said it’s adding support for Apple Homekit and AirPlay 2, which means iOS fans will be able to send video, audio and photos to the TVs with relative ease. Vizio hasn’t mentioned any exact prices or release dates at this point, though it said some of the new models will begin rolling out this spring.